I was crocheting last night and I got a little wild! He's got a bunch of pins in him and his eyes and teeth haven't been glued on yet but I'm just too excited to keep him to myself! Anyway, a member of my facebook page commented that the monster reminded her of the Wild Things so once I read that it kept swirling around in my head and one thing led to another and wa la! I used the exact same pattern as the monster (not released yet) and just added a different tail/eyes/and a furry head and of course did the shirt in 2 colors. And I'm in love! Thanks Katie (the lady who commented) and thanks to my daughter for the drawing! Like I said in my previous post, keep watching 'cuz you never know what monsters you'll find lurking here. And yes, there will absolutely be a pattern. I have to get the monster pattern up first. This one will be a separate pattern since it requires a bunch of different steps. I can't say when it will be ready.. it might be later in September since I have so many other things going on in my life at the moment. I probably shouldn't have posted him yet, lol but I love him so much I wanted you to see too! Oh my gosh......I AM IN LOVE!!!! I ABSOLUTELY LOVE HIM!!!! Now I am psyked to see the pattern!!! Sharon my love youve out done yourself here!!! He is so loveble!!!!!! Cant wait for the final pattern!!!!! I'm just thrilled with him. 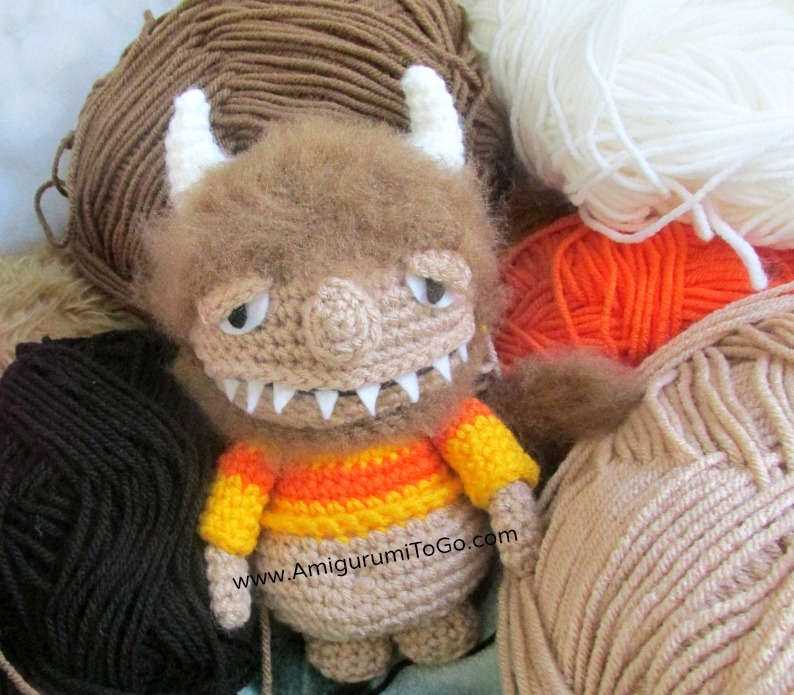 Where the Wild Things is my all time favorite book and I've always wanted to crochet the characters but never dared since I was scared to not do them justice, lol but this little amigurumi version is great and my daughter can say she had a huge part of his design and that makes my heart want to burst! He is so lovely and I really like it. Great work! That's so cool to see such creativenes in your crochet and thanks for sharing your talents with us. God bless you and your daughter for great ideas.